On 16th January 2019, London Stock Exchange Group launched the second edition of its ‘Companies to Inspire Africa’ report, identifying and celebrating some of Africa’s most dynamic growth businesses. 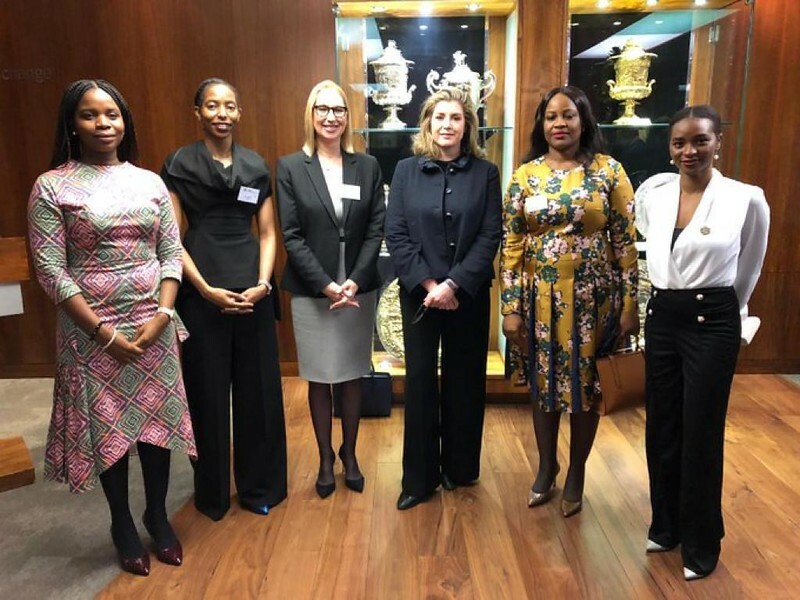 Lionesses of Africa Founder and CEO, Melanie Hawken, was a guest speaker at the high profile event in London, invited to showcase some of Africa’s most inspirational women-led growth businesses who were included in this year’s report. The Companies to Inspire Africa launch event commenced in energetic style with a Market Open Ceremony on the balcony of the London Stock Exchange Group attended by invited dignitaries, guest speakers and entrepreneurs. The event commenced in earnest with the opening address given by David Schwimmer, CEO of the London Stock Exchange Group. He was followed by UK International Development Secretary, Penny Mordaunt who gave the official UK government welcome to guests attending the event. A capacity audience included the CEOs of featured companies, African government representatives, Africa-focused investors and trade groups to the Group’s London headquarters. Also in attendance were official partners to the report, the African Development Bank, Asoko Insight, CDC Group and PwC, together with sponsors Instinctif Partners and Stephenson Harwood. The first panel discussion of the morning looked at themes emerging from the Companies to Inspire Africa report, including: The Success of the Consumer Services Sector; Regional Themes and Divides; and the Broader Role of Growth Companies in African economies. Moderated by Deanne Chatterton, CEO of Instinctif Africa, the panel included Charbel Antoun, Chairman of Eat ’N’ Go; Judith Karl, Executive Secretary of the UN Capital Development Fund; and Rob Withagen, CEO and Co-Founder of Asoko Insight. The next discussion was a Fireside Chat taking a 360 degree perspective on Investing in High Growth Companies. Moderator Lanre Akinola, editor of Nurmara hosted the discussion, which included: Assessing the size of Africa’s high growth sector and key drivers; Features unique to investment in Africa; hurdles faced by both investors and entrepreneurs; and the role of the company and investor in de-risking investment. Speakers included Tom Greenwood, Group CFO of Helios Towers; Warwick Hunt, Managing Partner and COO of PwC UK; and Nick O Donohoe, CEO of CDC Group. Panel Discussion 2 was a real highlight of the event for women entrepreneurs as it focused on the topic of Women Leaders in Africa. 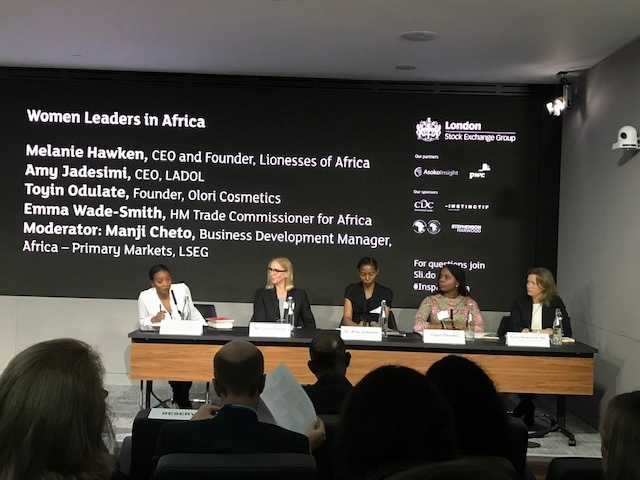 Moderated by Manji Cheto, Business Development Manager, Africa-Primary Markets at the London Stock Exchange Group, the discussion tackled such issues as Access to Capital for Female Entrepreneurs; the Global Context of Progress in Africa; Sectoral Divides and Further Steps. Lionesses of Africa founder and ceo, Melanie Hawken, was one of the guest panelists talking about the impact that supporting the growth and development of Africa’s women entrepreneurs can have on the continent’s economic future. Other panelists included powerhouse women entrepreneurs Dr Amy Jadesimi, CEO of LADOL, and Toyin Odulate, founder of Olori Cosmetics. The final panelist was Emma Wade-Smith OBE, HM Trade Commissioner for Africa, and a leading supporter of economic development through entrepreneurship and business investment. The final panel discussion of the morning addressed the challenge of how companies need to best prepare for the next stages in their growth. The session, which looked at hurdles to accessing capital, the role of corporate governance, and key best practices which need to be implemented, was moderated by Umerah Akram, Head of ELITE UK and International, London Stock Exchange Group. The Companies to Inspire Africa 2019 report identifies a new cohort of fast growing and dynamic private businesses across Africa. 360 companies were selected from 32 countries. Nigeria and Kenya lead the way as the countries with the most companies featured in the report. Exceptional growth rates reflected in featured companies’ CAGR of 46% revenue CAGR and average employee CAGR of 25%, over three years. 23% of the companies are led by women, almost double the proportion reported in 2017. 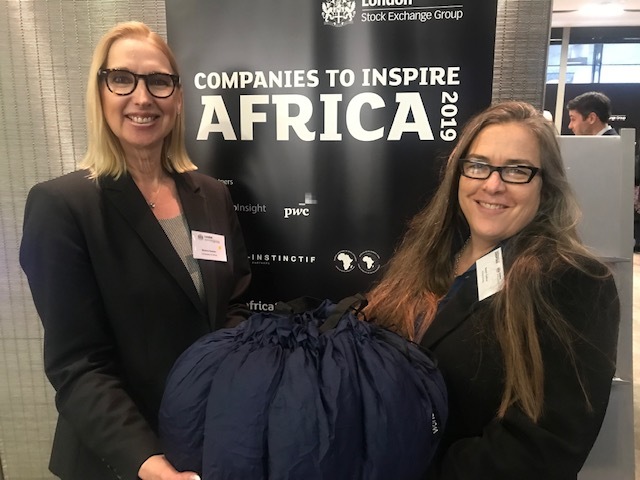 Melanie Hawken, founder and ceo of Lionesses of Africa with Sarah Collins, founder of Wonderbag, a nominee in this year’s Companies to Inspire Africa 2019 report. Lionesses of Africa saw a number of its most inspirational, nominated companies from across the African continent making it into the final publication. These included Adele Dejak Ltd (Kenya); Melvin’s Marsh International (Kenya); PMS Group (Kenya); Selfina (Tanzania); Delight Uganda (Uganda); Securico (Zimbabwe); Wonderbag (South Africa); and Secure ID (Nigeria). Consumer Services was the most represented sector with 79 companies – reflecting the growing middle class and the increasing importance of consumer products and services in African economies. 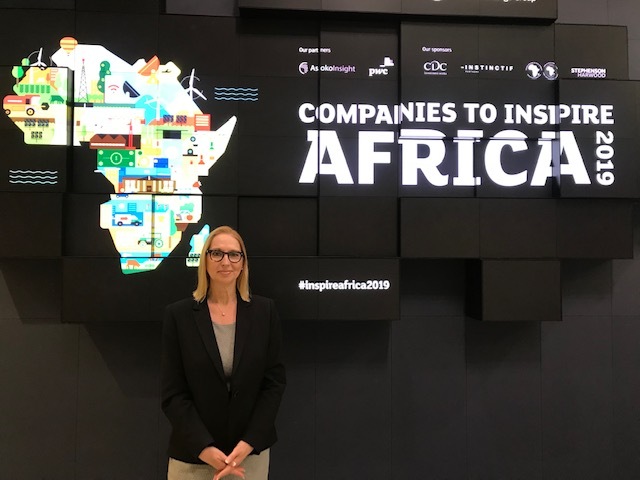 ‘Companies to Inspire Africa 2019’ includes contributions from government including the UK Prime Minister, Theresa May; the President of Kenya, Uhuru Kenyatta; and Lord Boateng, former UK High Commissioner to South Africa. The chapter introduction on Empowering Women Across the Continent was written by Melanie Hawken, founder and ceo of Lionesses of Africa. The report was produced in partnership with African Development Bank Group, CDC Group, PwC and Asoko Insight who contributed their insight and expertise to select the featured companies, and the report is sponsored by Instinctif Partners and Stephenson Harwood. “I am particularly pleased that nearly a quarter of the companies in this year’s report are led by women, almost double that of the report published in 2017. 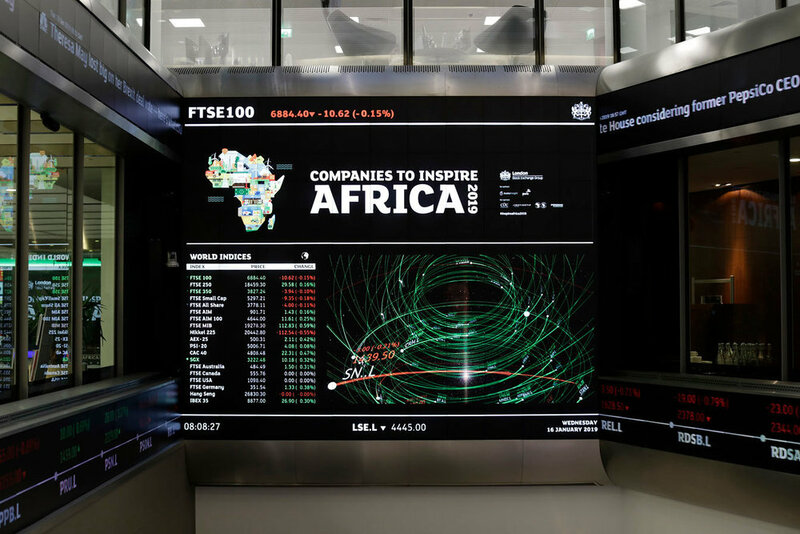 "London Stock Exchange Group’s ‘Companies to Inspire Africa’ report showcases inspirational and entrepreneurial businesses from across the African continent, representing a wide variety of industries and countries. It is particularly encouraging to see the increasing influence of women in leadership roles in these fast-growing companies, playing a pivotal role in shaping the future of African business. These high growth companies have the potential to transform the African economy and become tomorrow’s job creators. At LSEG, we are committed to helping companies realise that potential and we are pleased to highlight and celebrate the company success stories behind one of the world’s fastest growing markets."